‘Tis the season for stress and chaos and seasonal affective disorder. From flight delays to lack of sunlight, the winter months can attack our well-being from all angles. In the midst of all the craziness, you might forget to take care of yourself. Whether that’s by spending an entire weekend in your pajamas or buying yourself something pretty, acts of self-care are so important this time of year. So, show yourself some love with a gift just for you. *FYI: This post contains affiliate links, but each product was editorially chosen. All prices were accurate at time of publication. Do you own a signature piece of jewelry? One that goes with everything and really belongs to you? This gold bar necklace is a timeless piece that’ll add a touch of pretty to any outfit. Personalize it by engraving up to 21 characters—letters, numbers, or symbols. Get it from Stella & Dot for $69. Art of Tea is a tea importer and wholesaler based in Los Angeles, California—known for their custom-crafted organic teas. This gift set was made for someone who appreciates a good cup of tea. It features four canisters of loose-leaf tea: English Breakfast, Earl Grey Creme, Jasmine Pearls, and Egyptian Chamomile. Get it from Art of Tea for $80. This eco-friendly tube is filled with 100% certified organic, fair trade, cold-pressed coconut oil. Use it to moisturize dry winter skin, tame fly-aways, whiten your teeth, etc. Psst: For every one sold, Conscious Coconut donates a meal to a child through Feeding America. Get it from The Detox Market for $17. Raise your hand if you live in T-shirts on the weekends (or all the time—not judging). Add another cozy tee to your collection—but not just any tee. This “History Maker” tee benefits the National Women’s History Museum, whose mission is to inspire and empower through education. They’re also creating a movement to honor women in a brick-and-mortar museum on the National Mall in Washington, DC (the first museum of its kind!). Get it from Omaze for $32. From the hands behind those addicting videos you can’t just scroll by on Facebook (and a casual 400 million+ views) comes this scrumptious cookbook. Good Food Book features a curated selection of Tastemade’s most popular recipes. Plus: Each recipe has a scannable QR code so you can watch the how-to video on your phone. How’s that for easy baking? Get it from Tastemade for $29. Stay warm, snuggly, and fabulous all winter long with this gorgeous, burgundy, faux fur jacket. The full-zip bomber jacket features long fitted sleeves (with ribbed pink and tan cuffs) and diagonal front pockets for style and functionality. And, hey—if your office insists on setting the temperature to freezing, you can rock this jacket all year round. Get it from Lulus for $169. Bonus: Use code take15 for $15 off + free shipping on orders $150+. Treat yourself to a curated selection of the best wines of the season. 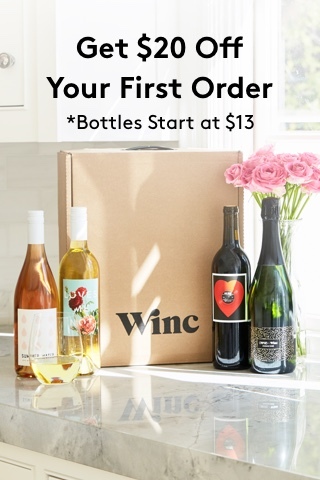 VINEBOX selects a mix of trending varietals and vintage cellar releases each quarter, letting you indulge in your own private wine tasting at home. Discover 9 new wines a quarter at VINEBOX for $72+/quarter. Yes, yes—these vitamins are trending all over social media. But it’s not just good marketing; it’s a genuinely good product—and one that could make you feel healthier and more energized. If you’ve ever felt nauseated after taking a multivitamin or wondered why you needed more than 20 ingredients in a pill, this vitamin was made for you. Ritual’s Essential for Women multivatamins contain only the 9 most essential nutrients for women in bioavailable forms. And they taste like peppermint, so they’re super easy to get down! Get your first month’s supply for $30 at Ritual. Give yourself a gift that gives back. CAUSEBOX curates a quarterly box of beautiful and useful products from socially conscious brands. Each box is filled with at least $200 in value for a fraction of the price. Past boxes have included a leather keychain handmade by artisans in Haiti, a gold-plated bracelet whose sales provide meals to those in need, and a handmade scarf made under Fair Trade conditions in India. Get the winter box for $49.95+ at CAUSEBOX. Everyone needs a signature pair of booties—ones that’ll dress up or accentuate just about any outfit. These ones from Sole Society slip right on and feature a 2.5-inch heel for comfort and style. Get them from Sole Society for $99.95. Also available in black, taupe, and burgundy. Bonus: Sign up for Sole Society emails for 15% off your first purchase of $80+. Free shipping on all orders $50+. Get it from Brookstone for $239. Also available in black. Bonus: Take $10 off $80, $12 off $99 or $15 off $120 with code AFF625 at checkout! Metallics. Jewel tones. Fringe. What’s not to love? This jacket is just one of many gorgeous seasonal statement pieces available from designer and fashion mogul Rachel Zoe. Everyone deserves to feel like a rockstar; this jacket is just one of many pieces that’ll give you just that. Shop the metallic collection at Rachel Zoe. Made by family-run Evolution Salt Co., this lamp emit negative ions to purify and clean the air by neutralizing allergens, dust, pollen, mold, fungus, pet dander, and odors. Plus: It looks beautiful when off or on and can aid in relaxation. The lamp comes with a UL/CSA approved wire assembly, which includes a 15-watt bulb. Get it from Thrive Market for $13.49. Trade in the bra you’ve been wearing for months on end (and likely not washing nearly as often as recommended #same) for one that fits well, feels comfortable, and is made to last. ThirdLove also lets you try on bras at home until you find the one that works best for you, so you can’t go wrong. Find your perfect style and fit at ThirdLove. Sweatpants and T-shirts are great, but have you tried one-piece loungewear? Laziness has never been easier. Or comfier. Or stylish-er. Get it from Kohl’s for $47.99. Bonus: Use code HOLIDAY25 at checkout through December 8 to get this jumpsuit for $35.99 instead. Journaling is great, but unprompted writing is not for everyone. What do you write? Where do you start? When do you stop? The 52 Lists Project makes self-expression and self-development easy with prompts for lists about life, love, and dreams—one for each week of the year. 17. An Expandable Bathtub Tray for the Best. Bath. Ever. Are baths your chosen form of self-care? What if you could make them 10x better? Throw in a bath bomb or salt soak, load up your bathtub tray with a candle, glass of wine, a book, and/or your iPad for a relaxing oasis you won’t want to leave. Byeeeee, neck and shoulder tension (ya know, where all that stress is held). This wrap provides hot or cold therapy to relive stress, muscle pain, and stiffness. It’s also filled with a relaxing blend of all-natural herbs and aromatic ingredients for an aromatherapy experience as well. Get it from Brookstone for $29.99. Cleanse the air in your home, increase positive vibrations, promote relaxation, or just enjoy the scent with this smudge spray by Rooted Earth Farm + Apothecary—an organic farm in Maine. The High vibes Smudge Spray is infused with quartz, palo santo (main scent), white sage, and cedar. Spray it in the air or on your body. This box is created for anyone who needs a little more self-love. Each box includes a book on self-development and self-love; resources like journals and online workbooks; and 3–5 self-care items like eye masks and candles. Sounds pretty delightful to me.